45: Apparently my body really wanted two days off so close together, because today I had LEGS ( and quite probably a tailwind). The miles this morning melted away, and by noon I’d already done 50. Just after lunch I rode past the places folks in Kitwanga recommended I camp. I stopped at a lake for a yoga break, where thousands of baby frogs had just hatched. Individually they were cute, but in that quantity they looked like swarms of termites or cockroaches – they created the illusion the whole ground was crawling, which was altogether kind of gross. I just kept pushing and didn’t feel any fatigue until I was within shooting distance of the Meziadin Lake Campground. I stupidly asked the campground host if there were any other cyclists around before sharing a site with John and Virginia from Manitou Springs. They were delightful company, sharing salad and chocolates and giving me the relevant sections of the Milepost road guide they were finished with, and let me store my food in their RV. Shortly after climbing in to my tent, the campground host came around to collect fees and chewed John out for letting me stay with them – “you know this is illegal, right, but I’ll let it go this time.We see it with cyclists all the time, they expect everything for free just because they’re on a bike. This is my summer business, you know.” I sat frozen in my tent, unwilling to make my presence known (let them think I’m at the bathroom?) , overcome with guilt and embarrassment. Not that the campground host can really play victim, right, since it’s a provincial park campground, not a privately owned site? For whatever reason, camping alone in the wild makes me exceptionally uncomfortable. I know i set out on this trip to explore vulnerability and isolation and to push my comfort zone (and I have done a really good job of avoiding both so far). What I’m really exploring is why someone as independent and introverted as myself so desperately clings to the company of others, even if they’re strangers. Were I traveling with someone, bush camping off the side of the road wouldn’t bother me…but apparently today riding an extra 30 miles felt better than facing the discomfort and fear of doing it alone. It is not the distance, or physical exertion, or finding the ability to ask for and accept help which will push me on this trip. It will be in finding myself utterly alone. I don’t know what is worse, the fear of camping alone, or the shame of sitting in my tent hiding from the camp warden while he confronted john about my “misdeed.” Is it really so wrong of me to share a campsite with folks in an RV instead of registering my own? What would you have done? 46: Today was as hard as yesterday was easy. I joined Virginia and John for a cup of tea and then set out into the damp morning. I was promptly greeted with a sign informing me of 20km of 6% grades – nothing like a good climb on a cold start to get the internal thermostat confused. As I reached the top, the rain started. The one good thing about cold rain is that it brings out the bears. I saw a magnificent black bear(#8) posed majestically on a ledge above the road cut, but I was descending too fast with wet brake pads to stop and take photos. It rained off and on all day. I couldn’t get my layers right: either cold or sweating or getting wet. By mile 20 I was miserable.Once Down into the bottom of the next valley, the road follows the river upstream, so it was uphill almost all day. I met a south-bound Dutch cyclist at my lunch pull-out, and he told me the camping at Bell II (the local Heli ski lodge/outfit and my goal for the day) was very expensive. The Milepost informed me of a scenic rest area next to a lake 2km short of Bell II, so that is where I camped for the night. The bear-proof garbage cans (Canadian: “litter bin”) open from the back, and you can easily store your food there underneath the garbage bags, eliminating the hassle of bear bagging (and safer!). 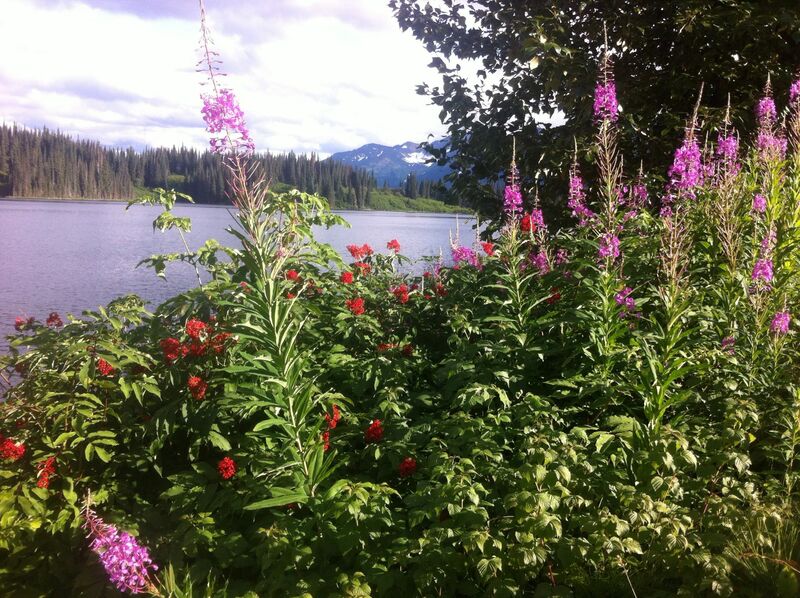 The fireweed along the lake was beautiful, and it was surprisingly peaceful and sunny. I even heard loons calling back and forth. Shortly after crawling in to my tent and flipping through the Milepost, I learned that “it is unlawful to camp overnight in turnouts and rest areas.” So I was back to feeling uncomfortable again, paranoid that the sound of every car pulling in would be the park ranger kicking me out. The one vehicle that did come down to my spot by the picnic tables happened to be a group of environmentalists heading to an anti-pipeline music festival in Iskut. I got out of my tent for a snack and to chat with them because they’re conversation sounded interesting. We discussed bears and the illusion of increased safety in a human environment (rest area vs campground). Not 2 minutes after they left, as I was coming out of the outhouse, a black bear(#9) ambled down the highway and off into the brush on the other side of the road. They’re out here and hopefully not as hungry as I am. Tonight’s Mountainhouse Chili Mac supplemented with carrots really didn’t fill me up. I’m getting tired of tablespoons of peanut butter with every meal. 47: It was cold and cloudy when I woke up. I was surprised to have slept as well as i did, what with bear anxiety and the fact my air mattress has sprung a slow leak and need refilling every few hours. I hastily cooked my oatmeal and packed up rather quickly, then rode the frigid mile and a half to Bell II. I decided to pull in for pancakes and coffee and wait for the sun to do its thing (partly cloudy, a nice change from rain!) I probably should have picked something more substantial because it turned out to be (another) one of those days of constant hunger. I stopped at Bob Quinn Lake (a rest area beside an air strip that services the nearby mining operations, no lake in sight) for lunch, and caught myself being disappointed that nobody there offered to share their picnic. It’s become such a patern of behavior of retirees in RVs to take an interest in the solo female cyclist and insist she share their lunch/dinner/campsite/what-have-you that I’ve almost come to expect it. Instead, 2 PB&Js, half a block of cheese, a clif bar, the remains of the jar of peanut butter, and 5 fig newtons later…and she was still hungrier than Eric Carle’s caterpillar. The road got hillier, with sweeping views of rolling mountains between the trees. I was glad to get back up high and into more open terrain(even at the cost of following the power lines- I find it disorienting to be down in the trees; I like to know where I am relative to the world. This openness came at the cost of some very steep descents and climbs in to and out of creek beds. Thankfully there was a tailwind otherwise I might have been walking my bike. I met three southbound cyclists battling their headwind who recommended the Kinaskan Lake provincial park campground (their lunch spot) and passed along a(n accurate) rumor that the host there lets cyclists camp for free! Upon arrival, I picked out a lovely beach-front property. Shortly after, the folks in the next site pulled up in their boat and happily offered to fry me up a rainbow trout they jut caught (they had at least a dozen more in the cooler). 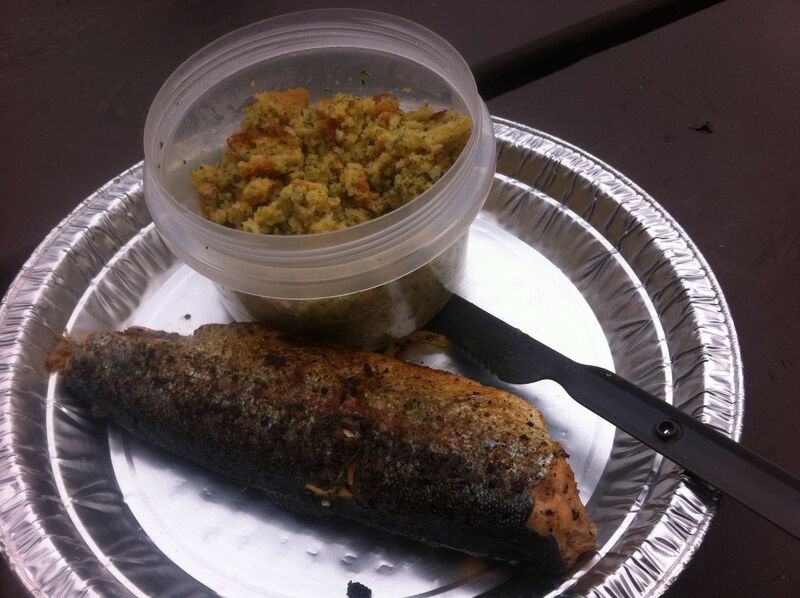 Oddly, they didn’t seem to want to chat much or actually eat with me: after cooking they climbed into their camper and I took my beautiful, tasty fish back to my picnic table to eat alone. The rest of the evening passed quietly, aside from a brief visit from the park host who does, indeed, let cyclists stay free. Bless her and smite the guy at Meziadin! 48: This morning was one of minimal motivation. I could hear a very light pitter-patter of rain when my alarm went off, so I slept in and took my sweet time breaking down camp. I rode slowly, stopped for 10 minutes to watch a bald eagle sit in a tree, and then wasted time in Iskut checking out the Sacred Headwaters Music Festival (absolutely nothing was happening, there were only about 5 people around and no music). Just out of Iskut I discovered that my dilly-dallying was a mistake. The road climbed relentlessly to the rest area where I ate lunch and was gifted a water refill from some folks in a camper. 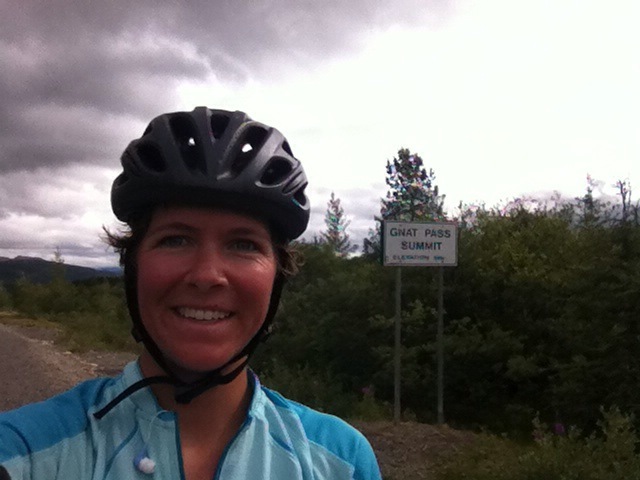 Then the road plunged back down to the Stikine River via some gravel switchbacks (not fun to ride), and abruptly began climbing again at an excessively steep grade towards Gnat Pass. As the road climbed into more open and alpine environments, the trees began to resemble Dr. Seuss creations and it seemed there could be no more climbing… Yet the map insisted 10 more miles to the pass. Finally I reached the top after what felt like an entire day of climbing. Just before Dease Lake I chatted briefly with somesouthbound Germans who had pulled off to set up camp – Here is their blog . I decided to treat myself to a big dinner at the first real cafe in days, and met another southbound German. We enjoyed our food together; he a burger and I a Salisbury steak with broccoli, baked potatoe, and soup. We then both went grocery shopping (I am going to try to go to Whitehorse without the 25 mile hilly backtrack to Watson Lake, which means carrying more food), and he enlisted my help to eat the half gallon of ice cream he’d purchased. I don’t know why I didn’t come up with this starte: it’s far more cost-effective than individual cones. On the other hand, if I ate a half gallon of ice cream by myself, my stomach would be a bit angry. I sent him up the road to join his compatriots, while I headed a few more miles north to a private campground that was rumored to have showers(which I really need-in the plural), but doesn’t. It was late enough I decided to stay anyway.